An India-Pakistan encounter that does not involve terrorists or silly politicians or bad-mouthing 'them'? Never thought it was possible. But writer-director Mudassar Aziz manages that and offers us a funny story on a runaway bride, harried cops, silly cops, ambitious fathers, arranged marriages, and so much more... Mostly predictable, but delightful nonetheless. Happy Bhag Jayegi isn't the kind of film that will have audiences rolling in the aisles. But it might occasionally induce faint smiles on some faces. Diana Penty, Abhay Deol film begins well but soon the laughs are few and far between. A weak script fails this film and its cast. Overall, it is a feel-good, light-hearted comedy which will make one laugh and giggle till the movie ends. In Mudassar Aziz’s winning movie, a reluctant bride elopes on her wedding night and lands up in Pakistan. The humour in this film is understated – no crass jokes, no obscenity, nothing offensive. ‘Happy Bhag Jayegi’ is not flawless, but this film left me with a big smile. Guddu does nothing for his livelihood and is fond of music. Happy Bhag Jayegi' will be happily acceptable by the people who love feel-good types of films, despite of its flaws and weakness. The fun elements associated with this movie will keep you engaged and smiling throughout the film. Diana Penty’s miserable attempt to reprise Kareena Kapoor’s Jab We Met role of Geet! li Fazal gets a great platform to establish himself as an actor here and is promising. From the supporting cast, Piyush Mishra, essaying a sceptical cop is a fun addition and the Hindi interpretations of his Urdu words are hilarious — 'mausiqi' is taken to be an expletive involving a 'mausi'. Happy Bhag Jayegi' is clean family entertainer but could have been exemplary! Overall, “Happy Bhag Jayegi” is a feel-good, light-hearted drama that does not need to be taken seriously. Happy Bhag Jayegi is a good-hearted comedy with all the ingredients well mixed, and the actors are too good. Abhay Deol and Diana Penty’s Indo-Pak romcom is a decent one-time watch! ‘Happy Bhag Jayegi’, just like its female lead, is likeable without being memorable, mainly due to a weak third act and under-confident direction. Yet, it delivers enough laughs to justify a viewing. Predictability runs all through the plot. The second half typically gets all the lead characters in one place and thus begins the chaos. It could have been more tightly written since, multiple sub-plots kill all the fun. Happy Bhag Jayegi is a good fictional attempt at highlighting the brighter side of India-Pakistan relations under waggish circumstances. Contradicting to its genre (Comedy), the film falls flat on audiences. 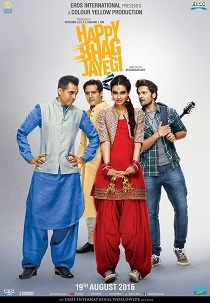 Happy Bhag Jayegi is a fun, innocent caper that should assure a few good laughs.